If a prototype of the Hyperloop – Elon Musk’s futuristic superfast train – ever gets built, it will have to overcome some very significant engineering challenges that may or may not be solvable. After reading through the published document that explains how the concept works (it reads something like a cross between a patent application and a Popular Science article), I can’t say that it will or it won’t work. But I do have opinions on the plan’s strengths and weaknesses. I should point out that, while I’m not an engineer. I have helped design systems that use compressed air and deal with the aerodynamics of large structures. I’ll start with my opinion of what the plan has going for it, followed by important challenges that still require a solution. The most important element of the concept paper is that it doesn’t really invent anything. Everything described in the plan has been built for other applications and proven to work. The electric engine and battery pack would be variations of what Tesla has built in the Model S. The steel tubes, through which the passenger pods would travel, would be carefully aligned versions of pipeline tubing. The compressor on the front of the pod would be similar to any industrial compressor. Every entrepreneur claims that his or her idea will be cheaper than the currently available technology, and just about every entrepreneur turns out to wildly overestimate how cheap his or her system will be. Musk’s paper does an excellent job of detailing exact pricing of each element of the project so that there’s no magical thinking involved in the pricing expectations. Musk began this project when he realized how awful high speed rail is as a transportation solution. Although we’re comfortable with trains, few of us really appreciate how much it costs to build a brand new rail line. The $68 billion price tag for California’s rail project seems outrageous, but it’s actually not too expensive in the world of high-speed rail. It’s worth considering that perhaps the craziest option is to spend $68 billion on a more conventional alternative to the Hyperloop. The biggest concern with this plan has to do with temperature. The pod will be compressing air and expelling it downwards and backwards. All that air compression creates an enormous amount of heat, which can damage the pod and its machinery. Musk’s solution is to add to each pod a water tank that will capture that heat and turn it into steam to be collected at the next station. Although the thermodynamic calculations are correct, a small pod with only a few cubic feet of room for a heat exchanger leaves little space for an efficient exchange of heat. That means that the flow of water must be increased, requiring a lot more water on board. There may be an elegant solution for this challenge, but it’s not in Musk’s current paper. Wind stress is another challenge. Any structure elevated 100 feet off the ground is going to be under a lot of wind pressure, which will act on it in weird and sometimes multiple directions. If that structure is a heavy tube stretching hundreds of miles in either direction, you effectively have a big sail. Will the concrete pylons be powerful enough to resist that pressure? 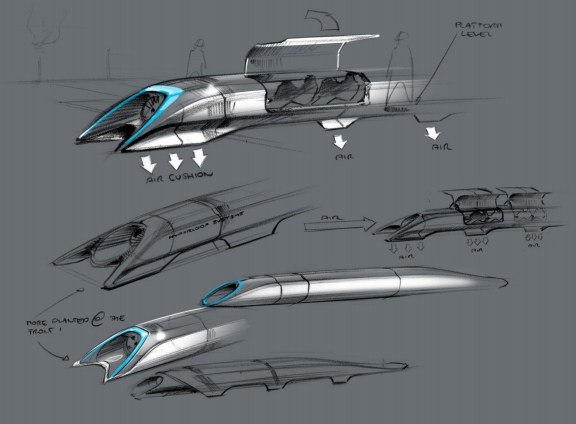 The Hyperloop may or may not ever get built. But there are few examples of a billionaire spending his own time and money on giving the world a unique idea that’s been well thought-out and clearly worth investigating further. Musk’s vision and audacity should be applauded. This article originally appeared on the blog of Navigant Research, a market research and consulting team that provides in-depth analysis of global clean technology markets. Navigant Research is also a partner of GigaOM Pro, GigaOM’s premium research service. Regarding the wind: the tube would be quite thick walled and stiff. The total length is irrelevant, what does matter is the stiffness of each segment – only 100 feet or so, seems. This part should be about the easiest to sort out by bridge designers, I guess. Regarding the heat calculation, it is likely given by the kinetic energy when launched: Not really that much (was it m*v^2? ), and part of it would end up in heating the thin air in the tube, not the vehicle. Whatever criticisms there are, this plan deserves consideration. I appreciate Sam’s comments, particularly the one saying that the components needed are not new. I’d even suggest putting the “bullet train” on hold – what a waste of my California money! I see an issue with the amount of energy which will be required to be stored on board each capsule. Enough energy to compress all of the air in a large diameter tube the length of California within 30 mintues! Do batteries have sufficient energy storage density? Weight? If a capsule stops in the tube for any reason – how do the people get out? You will have up to 50ish capsules all stopped at different places in the tube! Good article and well put. As folks bring up additional problems to be solved his could be worked on. As an open source type of idea it does deserve scrutiny, and also good old fashioned due diligence. The may folks with smarts out there can take this challenge and make it so. Re heat: you have an enormous amount of steel surface area. Is heat dissipation really a problem? One issue is the cost, if Musks estimates of pricing are correct we would see a proliferation of hyperloops, if the system uses much less energy than conventional rail the idea might be applied to freight as well-the key question is, how realistic is the estimate of cost? I would think, at that ‘altitude’, life expectancy with or without the oxygen mask might approach 90 seconds. Maybe a bit more. I don’t see anything impossible, other than building it for the quoted price. The EPA studies and lawsuits will cost more than that. The political graft twice that. /snark. On a more serious note: The necessity of maintaining a weak vacuum in a 400 mile tube is going to be a real challenge. What happens if–strike that–when that vacuum is broken? What happens to the 40 or so pods in the tube? What happens if a pod breaks down? How do they handle egress? 100 pascals is roughly .015 psi. That’s a weak vacuum. And over the length of 400 miles, not at all trivial. I hate to come to the blog of someone I don’t know and criticize them, but since the front page of Google News today had an article from USA Today called “Why Elon Musk’s ‘hyperloop’ transport won’t work”, citing you, I really feel I have no choice. Did you even think about what you were writing? Ugh. First off, there can be no more total heat output than the maximum energy stored in the batteries. Otherwise you’re getting free heat from nowhere, aka, perpetual motion. Likewise, the total heat can’t be more than the max power output of the compressor, plus the trivial battery and wiring losses. Of course, the compressor won’t run at 100% all the time, and a good part of the heat will end up in the tunnel and radiated through its vast surface area, but lets just pretend it’s running full power 100% of the time and *all* the heat ends up in the car, *and* the car loses no heat to its surroundings. The compressor is 325kW, aka, 325000 joules per second, aka 585 MJ per trip. Raising 20C water to boiling takes 4.186 joules per gram per degree * 80 degrees + 2260 joules per gram for the phase change, aka ~2.6MJ per kilogram of water. Total water mass in this absolute worst case scenario? A whopping 225 kilograms – under 60 gallons. Oh no, the world is going to end! Likewise, seriously, it’ll be in the air and get winds, that’s your reason? Like, say, oh I don’t know, *a bridge*? Do you think bridges don’t work? The cross section on this thing is no bigger. Ugh, I guess I shouldn’t be ranting at you. I should be ranting at USA today for listening to you. You are incorrect. The Hyperloop is designed to be accelarated by means of magnetic propulsion built into the pipe at the beginning of the journey. There is an external source of power for the vast majority of energy consumed. That power mostly turns into motion and heat. The heat buildup is relatively low considering the speed and distance that’s being travelled (thanks to the depressurization of the pipe), but it still will get to extreme temperatures without some sort of heat exchange mechanism. Musk’s proposal calls for something like a car radiator with water as the heat transfer fluid. A car radiator works great–at 100 miles per hour. At 700 miles per hour, it would fail quickly. I look at Musk’s design as being very elegant, with thorough solutions for most problems that are hard to challenge–with the exception of the steam coolant. You also did your calculations at the end of your comment wrong. You’re calculating maximum heat production by the kw capacity of the compressor. You would have to calculate it by the energy content of the pressurized air. As mentioned earlier, there’s a lot more energy involved than just what the compressor is utilizing. You’ve now moved the goalpost. You wrote, “The pod will be compressing air and expelling it downwards and backwards.” You were talking about the compressor. Now you’re talking about aero drag-induced heating. There are CFD sims included, so that work is already done. The air in front of the vehicle is at very low pressure, and maintained suchly via use of a compressor. Drag heating is roughly linearly proportional to pressure. The heat exchanger has nothing to do with skin heating. The vehicle is in no more difficult of an operating environment concerning skin heating than an airplane. Due to the small length and streamlined shape, I would automatically expect the flows to remain predominantly laminar. The CFD bears this out. And in the most difficult area, the skis, there’s air injection, which while not done for this purpose, is a well known way to help restore laminar flow and reduce skin drag. Have I bothered to mention that the majority of heat from skin drag ends up as heat in the *air*, not the vehicle? Just ignoring how efficient skin cooling is when air is moving over your skin at hundreds of miles per hour. Lastly, “pressurized air” has no energy content. Energy can be harnessed from *differences* in pressure, but the whole point of the system is that the net pressure ahead of and behind the vehicle remains roughly constant (and very low). The biggest challenge is experiential. As smooth and efficient as the plans make the ride out to be, sitting in a 4.5′ wide pod surrounded by solid steel for half an hour would likely induce a claustrophobic sensation similar to that of an MRI machine. An article about nothing, anyone? Stopped reading at, “I’m not an engineer.” Then I decided to give it another chance. I shouldn’t have. If you stop reading technical discussions at “I’m not an engineer”, then you can’t read Musk’s paper on Hyperloop. He’s not an engineer either. Do you think all of the CFD diagrams and the like appeared out of thin air? The guy employs literally hundreds of engineers. Not to mention that he is a *physicist*. He has a BS in physics from the University of Pennsylvania. And he’s on the board of the National Academies of Aeronautics and Space Engineering and the Stanford Engineering Advisory Board. No – he’s a physicist running two of the most successful innovative companies in the country instead of an MA in Near East studies. I know who I’d go to for a tech opinion. Get over yourself! Sam needs to learn to stop digging when he’s in a hole. I got the impression from reading Mr. Musk’s PDF that the tubes are not standard pipes, but custom-built to Hyperloop’s specs. Probably some wind-tunnel testing for scale models will help to refine the design characteristics needed to withstand wind conditions. That seems like a small issue, easily addressed. But the heat dissipation problem you identified does seem to be a large hole in the engineering concept. Mr. Musk’s PDF leaves capsule cooling poorly addressed, and tube cooling wasn’t addressed at all. I didn’t see any toilets in the design, either. They’ll need them! Biggest problem I see is that there is only one lane in either direction. If there is a problem OF ANY KIND, (maintenance, disabled pod, etc.) the entire route needs to be shut down. Speaking of disabled pods, if a pod goes down, explodes, whatever, then the pod behind it is only 30 seconds behind it. Can a pod slow down from 700 miles per hour to full stop in 30 seconds? Depends largely on the g’s you are willing to tolerate. An emergency deceleration can be much more intense than regular operation, easily in the 3-4g region (29.4 – 39.2 m/s^2). At that rate you’d decelerate from 340m/s (speed of sound) to a standstill in roughly 10 seconds, giving you an additional 20 seconds of reaction time. The rapid deceleration can be achieved in a number of ways, ranging from mechanically contacting the tube walls via specially designed friction pads to solid-fueled retro rockets. Capsules further than 1 accelerator section away can be decelerated electrodynamically at the next active section and then come to a stop using regular wheel brakes. It’s sad when the first 2 words of the title contain a grammatical error. Use Tesla eV’s expensive packaging as a distraction to kill electric cars green infrastructure. This trick can be repeated to kill the green and affordable high speed rails infrastructure as well. Great idea but where do you go to the bathroom? 30 minute transit. hold it. It may be more feasible in the short term for intercity transport, not necessarily coast to coast. Sounds good. That’s exactly what Musk says in the paper. He suggests that supersonic aircraft are impossible to beat for any trip lasting more than a few hundred miles.